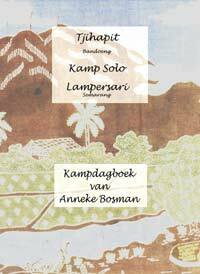 This book contains a part of a Dutch family story in the Dutch Indies during the Japanese occupation (1941 - 1945). This doctor family with 6 children suffered hunger, fear and terror, but happily they survived. Afterwards they could go back to Holland in health. Dieter Beitsma: A good friend in Canada translated the stories into English. We thank him for all the time and troubles, given without financial interest. He did it to please an old lady, who couldn't understand Dutch. If you insist in giving a contribution, please send it to the Foundation "Heart for Haiti". After reading the book some people ask: "Well, what about the life of the girl Anneke Bosman after these stories?" She finished her studies at the grammarschool in Haarlem and started nursing in the Academic Hospital in Utrecht. After getting several degrees she worked during one year in the Academic Hospital in Brussels. In 1956 she married Wiebe Feenstra, an interpreter/translator of Spanish. They got a daughter and three sons, which grew up prosperously. They also married and got their children (now 7 grandchildren!). Later on her husband studied theology and they made their entry into the Old-Catholic Church, which is related to the Anglican Church in liturgy and communion. He served as a priest till 1997. After his retirement they had a good time and they enjoy rest, making visits and having fun in their hobbies. If it is Gods will, they hope to keep it like this for a long time.